Just in time for Valentine’s Day on February fourteenth, a new Jane Austen-inspired anthology has been published to fill our romantic hearts with Mr. Darcy and Elizabeth Bennet and many other characters from Austen’s beloved novels. A Very Austen Valentine contains six novellas by popular Austenesque authors: Robin Helm, Laura Hile, Wendi Sotis, Barbara Cornthwaite, Susan Kaye and Mandy H. Cook and includes stories inspired by Pride and Prejudice, Persuasion, and Sense and Sensibility. Featuring many of our favorite characters, readers will find sequels, adaptations, and spin offs of Austen’s works in this new book. I am very happy to welcome three of the A Very Austen Valentine authors to Austenprose today. They have kindly agreed to an interview. Welcome ladies. Here are a few questions to introduce us to your new anthology, your writing process and philosophies, and an opportunity to tell us about your next project. Can you share your inspiration for this Austen-inspired anthology? Laura: Several years ago Robin Helm and I talked about putting together an anthology – no small feat, as Laurel Ann knows (Jane Austen Made Me Do It) – and last Christmas we banded together with Wendi Sotis and Barbara Cornthwaite to release our first. Who knew that Jane Austen and Christmas would combine so well? Our readers, that’s who! We were overwhelmed by the response to A Very Austen Christmas. Next, we decided to take on Valentine’s Day. This holiday was not widely popular during the Regency, but when we found extant Valentine cards from the period, we were off and running. A Very Austen Valentine is the result. There is something so satisfying about reading the third book in a trilogy. We have become personally entrenched in the characters and we know that important events will be resolved soon. Book 3, The Lady Must Decide, of author Laura Hile’s Mercy’s Embrace series does not disappoint; resolving some plot lines and leaving others open for possibilities. In this delightful continuation of Jane Austen’s Persuasion, our heroine Miss Elizabeth Elliot realizes the time has come for her to forge her own future. With exceedingly shameful reminders of her father’s abandonment, and her wretched dependence on the generosity and hospitality of her sister Anne and Captain Wentworth, she knows the only way to survive is to marry. And marry well. But the dilemma is who? Dare she follow her heart? Or accept a loveless marriage of convenience? Book 2, So Lively A Chase, left us dangling, breathlessly… all anticipation as to how Elizabeth would behave once she learned Patrick McGillvary’s true identity. Blessedly, this novel opens without missing a beat. “Look again dearest,” he said, very low. She was very near to the truth now. He saw her cheeks go pale.” p.12. Not only does Elizabeth suffer from society’s gossips and her reduced circumstances, now she keenly feels the betrayal of her closest friend. Meanwhile, Sir Walter and Lady Russell’s brash and mysterious escape from his creditors seems to unravel out of control; I wondered if the usually strong-willed and practical Lady Russell would ever come to her senses! In addition, her brother-in-law, Charles Musgrove becomes exceedingly disgruntled with his peevish wife Mary while increasingly captivated by the neighbor’s kindly and attentive spinster sister. It’s no wonder with all the failings and heartache from the men in her life that Elizabeth might feel compelled to settle. “‘Be grateful for what you have, Mary,’ Elizabeth said roughly. ‘Though you do not think it much, you have a home and a family. You have a future as mistress of Uppercross. That is something, even if your husband is a disappointment. I believe most husbands are.’” p. 48. Although there is a happy and satisfying resolution in this third book, some might argue Hile left much unanswered… which led me to surmise that a fourth book must be in the making. And lo… after a brief Facebook tete-a-tete, the authoress declared she is working on another installment. That said, this has been an incredible, satisfying series! 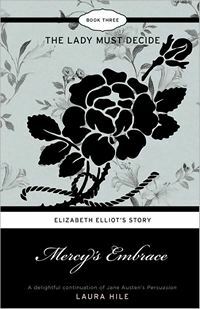 Who would ever have believed Jane Austen’s pretentious, vain, selfish, and thoughtless Elizabeth Elliot would be a heroine of her own story? It is a rare and truly gifted writer indeed who can transform such a universally despised character to one so beloved and passionately championed. With Hile’s absolute understanding of Austen’s masterpiece, respectful interpretation of original characters, strong plots and subplots, I can only imagine, dear Jane could not but regard this series the ultimate compliment to her Persuasion. At a time when all the new book hullabaloo is about E.L. James’ uber-sensationalized Fifty Shades of Grey, you may be looking for a great summer read that won’t make you blush at every page. I highly extol the virtues of Laura Hile’s Mercy’s Embrace series. It should be read sooner, then later. That is of course, unless you are into delayed gratification. 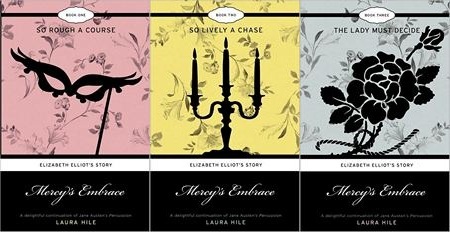 Enter a chance to win one of three (3) copies of Mercy’s Embrace: Elizabeth Elliot’s Story Book 1 – So Rough a Course, by Laura Hile, or one (1) full set of the trilogy which also includes Mercy’s Embrace: Elizabeth Elliot’s Story Book 2 – So Lively a Chase and Mercy’s Embrace: Elizabeth Elliot’s Story Book 3 – The Lady Must Decide, by asking Laura a question about her series or by sharing your reaction to any of the three reviews posted during our month-long author event each Saturday in May. Entrants will qualify for a chance at the drawing of one (1) copy of book one, or one (1) each of the entire set. Both print editions and ebooks are available. Contest ends at 11:59 Wednesday May 30th, 2012. Winners announced on Thursday, May 31st, 2012. Shipment internationally. Good luck! Austenesque Author of the Month – Laura Hile: Guest Blog & Giveaway! 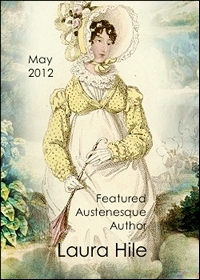 We are very happy to introduce Austenesque author Laura Hile as our featured author in May on Austenprose. Laura has written a trilogy to Jane Austen’s last novel Persuasion which continues the story of Elizabeth, Sir Walter Elliot’s eldest, unmarried daughter. Those of you who have read Persuasion or seen the great movie adaptations of it will remember that Elizabeth is quite condescending and spiteful to her younger sister Anne, and one wonders out loud why would we would want to read three novels inspired by such a unappealing character? Her faults are truly onerous, which, makes her story all the more intriguing. How will she be transformed, or will she? Such a heroine I’ve chosen for my Austen novels! What can I say? I simply could not resist her. Her name is Elizabeth, but she’s not from Pride and Prejudice. I’ve taken on none other than Anne Elliot’s awful elder sister from Persuasion. Yes, that Elizabeth. The woman most Austen readers frankly love to hate. Now don’t go by what you’ve seen in the movie adaptations. Jane Austen’s Elizabeth Elliot is poised and graceful, and at twenty-nine is more beautiful than ever. She has exquisite taste, is sure of herself, and is fond of having her own way. She is also the eldest daughter of a very fine woman, which means she behaves badly but knows better. In other words, she is me. Well, except for the beautiful part. And the graceful part. And the always being able to get her way part. Thank the Lord I have never been pretty enough to get away with airing all of my fine opinions! At the end of Persuasion Elizabeth Elliot is left in dismal straits, though she is too proud—and too stubborn! —to admit that. One way or another she must marry well, and so she begins to scheme. However, Miss Elliot is not as smart as she thinks, and that’s where the fun begins. She’s a scornful damsel in distress. What a delicious premise for a story! And now I’ll share another sorry truth about myself. As a book-lover, I am a hopeless snoop. Oh, I’m too polite to listen at keyholes or peer through windows. But with a novel I don’t need to do those things! Everything’s laid out for my inquiring mind to devour: private conversations, innermost thoughts, and daring undertakings! All of the excitement of real life with none of the risks! So perhaps the best way to introduce the “Other Elizabeth” is to allow you, my fellow book-lover, to snoop a bit. I present for your inspection a letter of Elizabeth’s. Can you discover what she’s about? I wonder if I might solicit your advice regarding a mutual acquaintance, Miss Caroline Bingley. Having suffered disappointment in your novel, she must wander into mine! And let me tell you, in Mercy’s Embrace Miss Bingley is making a thorough nuisance of herself. You viewed her as a rival (and I am heartily glad she was bested!) but I am seen as a social asset. Honestly, I do not know which is worse! What some people will do to advertise a connection with my family! Simply because my father is a baronet of ancient lineage, she must twitter and simper and hover round! And when my odious cousin, William Elliot, returned to Bath, what must she do but set her sights on him! I know what she’s after—my late mother’s title as Lady Elliot! And she mistakenly assumes that intimacy with me will further her cause. Not only does she cling like a leech at public functions, but she insists on mauling my name, calling me Eliza, or worse, Lizzy. As if anyone but a fishwife would wish for that! Miss Bingley must have rocks for brains, for she will not listen! I have told her, for example, that William Elliot has not yet inherited. It is most unwise to gamble on that, for so often the proper person does not die! And may I congratulate you, Mrs Darcy, for so wisely refusing Rev. Collins’ offer of marriage? I know all about marital desperation, but Longbourn was not his! It would have been madness to accept him! As to my own affairs, you may have heard various tales. I would like to point out that though newly divorced, Mr Rushworth is in full possession of both the Sotherton Estate and its princely income. As to remarks about his person, why, I have confidence that he will improve. Besides, I am accustomed to managing a foolish gentleman. Have I not put up with my father for years? As to rumors that I have been meeting a clerk in a Bath tea shop, kindly disregard them. My father’s business affairs are again in a sad tangle, and this time I am handling things. I refuse to discuss business in a counting house! I suppose there are women who find Mr Gill attractive. I am not one of them. But enough about me. If you would kindly reply, Mrs Darcy, listing any little thing that will irk Miss Bingley, I would be most grateful. As a girl Laura Hile pored over Victorian novels on her grandmother’s shelves, smitten with stories from a bygone era. The wonder of Gothic Romance and Jane Austen’s Regency came next. But it was not until serialized Austen fiction became popular that Laura summoned her courage and began to post stories of her own. To keep readers interested, she developed what has become her signature style: intertwined plots, cliffhangers, and laugh-out-loud humor. The comedy she comes by naturally in her job as a middle school teacher—there’s never a dull moment at school! Laura lives in the Pacific Northwest with her husband, the eldest and youngest of her three college-age sons, and a collection of antique clocks. 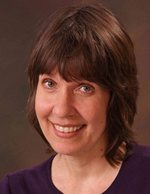 Visit Laura at her website Mercy’s Embrace; at her blog Jane Started It; on Facebook as Laura Hile Author and Mercy’s Embrace; and follow her on Twitter as @LauraHile. Just in time for Mother’s Day, Wytherngate Press is offering the full series of Mercy’s Embrace: Elizabeth Elliot’s Story at a discount through May. You can receive a 25% off the print edition at their online shop, or $2.00 off the ebook editions on Amazon, Barnes & Noble and other etailers. Many thanks to author Laura Hile for her wonderful guest blog introducing us to her heroine Elizabeth Elliot and for generous giveaways! Enjoy!